Stack Exchange Community Statistics results: In which ways do unregistered users participate? Source: In which ways do unregistered users participate? The results here are only for StackOverflow, as it pretty well dominates the network. The final month of February, 2012 was excluded because of partial data. The data presented covers all questions and answers. In case it isn't obvious in the following graphs, the percentage lines (green) are plotted on the right-side secondary axis (note: the scales are very different). The steep dropoff to zero for unregistered questions is due to requiring question-askers to register first, which was implemented at the end of September, 2011. The unregistered stats going forward are of course moot, but I figured it would be interesting to include for historical sake. 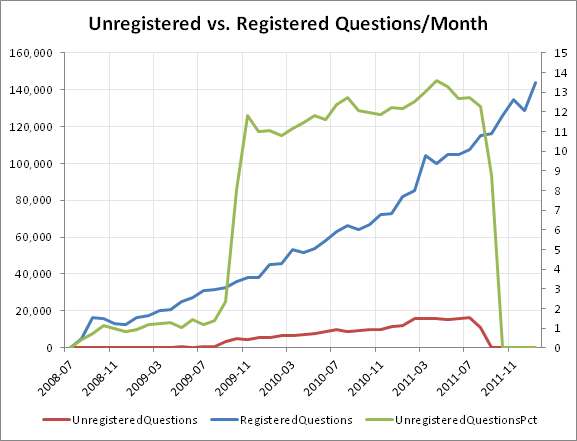 Even ignoring the tail where the unregistered rate was added into the registered rate, it does look a bit like the question-asking rate overall is increasing exponentially. Even looking through the feature changes list, it's unclear why the answer rate suddenly stagnated around March, 2011. The tail has to be ignored because of the increase in user registrations. The unregistered rate, although a bit hard to see from the graph alone, has been relatively constant since November, 2010. The drop in percentage share is due to the increase of the registered rate (which makes sense, again because of increased user registrations). 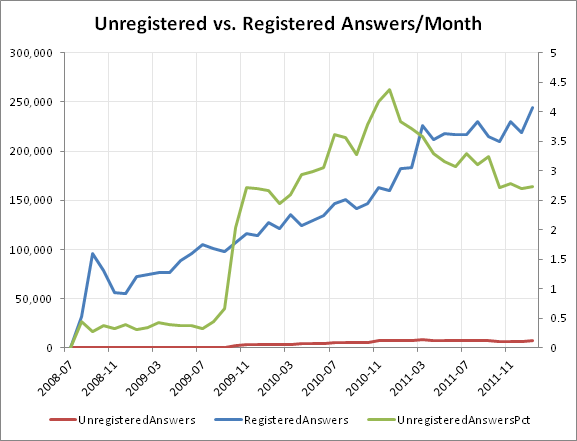 While the graph says nothing about post quality, the unregistered user participation rate is low enough that it may be worth considering abandoning unregistered answers entirely. These stats include accepted suggested edits (which are real edits after they're accepted). Not surprisingly, it looks like unregistered users edited questions more frequently than answers. 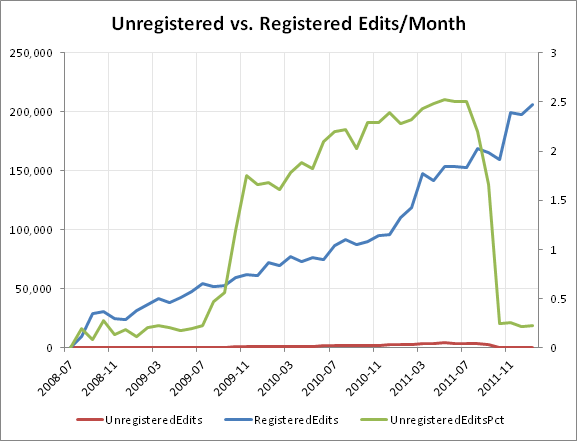 The big increase in edits in early 2011 is due to the implementation of the +2 rep bonus for an accepted suggested edit. On average, about half of all posts get edited, so it's critical to have that area of the application work well for users. If you'd like to have a look at all statistics I collected for this question, you can download the Excel spreadsheet here. Browse other questions tagged discussion answers edits statistics unregistered-users . Encouraging users to create an account (and keep it). Did it actually work? Stack Exchange Community Statistics results: What can we learn about migrations? Stack Exchange Community Statistics Results: How sportsmanlike are our users? Actually how important is accepting an answer to the Stack Exchange model?